This is a guide for FFXIV Black Mage. Since Black Mage offers both outstanding AoE DPS and single target DPS but also the best CC in FFXIV, Black Mage can be the top damage dealer when comes to single target DPS. To be a Black Mage, you must start your character off or choose the class of a Thaumaturge. Once you reach level 30, you can get access to the quest from the Thaumaturge guild located in Ul'dah.it is required you have both a level 15 Archer and level 30 Thaumaturge. The main stat as a Black Mage is Intellect. Since most things in game will not shot you except you move out of it, it is no use putting points into vit. And since all the gear we have obtained is relatively the same, we don’t have much control over it when it comes to secondary stats. But for the sake of priority it goes as follow: Int > Crit > Det > Spell Speed. 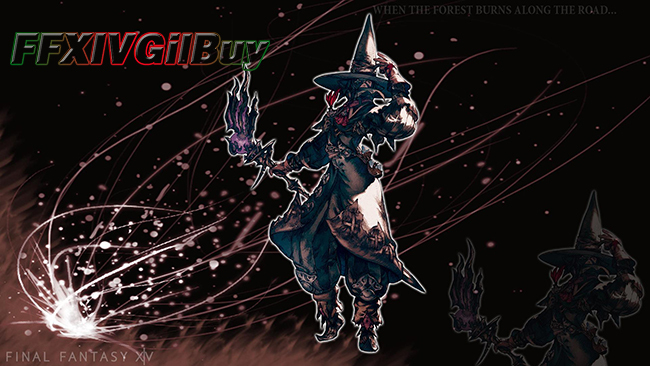 If you want to buy FFXIV Gil, FFXIVGilBuy provides cheapest FFXIV Gil with instant delivery! Fire spells is where you can find our highest DPS spells (Fire I, II, and III). Fire is main spell and the filler to our rotation. The Thunder spells are dot spells and replace at sort of auto-attack mechanic as a caster. Freeze is a sort of control spell. The cast time is long and the damage is low but it does Bind targets just like Blizzard II does but you get a ground target to choose where to place the cast.Sleep is by far the best CC in the entire game right now. Manaward can absorb the damage from magic spells and render you immune to the knock back. Lethargy can be used when you keep using fire spells instead of switch over to ice and lowering your DPS to slow the target down. Conversion can save life. It can convert 20% health into 30% mana. When you are using Raging Strike burst phase to get off an extra spell, you can use this. Apocatastasis is a good defensive cooldown which can be used to other players. For low level Black Mages, Transpose plays a vital role. Transpose can turn your Astral Fire stacks into Umbral Ice and vice verse. Aetherial Manipulation is final utility spell which can be used to quickly move across a field. It can be used to move out of AoE or move into a safe area where your character is standing before the cast. Flare is a powerful spell which can be learned after you finish your level 50 Black Mage class quest. Flare is the only viable in single target damage with both Conversion up and Swiftcast. It makes the long cast instant with swiftcast and you can conversion right after to have mana and go on DPS.